This combined degree is a Bachelor of Arts with a major in criminal justice and Master of Public Administration (MPA). Application to the graduate portion of the program is made after the fifth semester (at completion of 75 credit hours, 45 of which have been completed at GW with a grade-point average of 3.5). Please see the criminal justice program handbook for details on the application process. All requirements for the Bachelor of Arts in the field of criminal justice are to be completed, along with all requirements for the MPA degree. 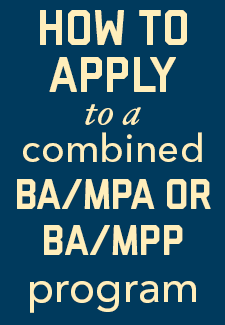 A total of 40 credits taken must be specifically applied to the MPA degree, but 12 of those credits are counted toward both degrees. Typically, students take PPPA 6000 (1 credit) in the summer either before or after their fourth (senior) year. The following (3-credit) PPPA courses are taken during the student's fourth (senior) year: 6001, 6002, 6003, and either 6005 or 6006--and these 12 credits are applied to both degrees. During the fifth year and following summer, students take PPPA 6004 (fall) and 6009 (spring) and either 6005 or 6006 (whichever was not taken previously), plus three courses in an MPA field of study and three electives. It will be necessary for students to conform to the established requirements for completing an application for the combined degree. Students applying for MPA and MPP degrees in the Trachtenberg School have the option of submitting GRE scores, but they are not required.